I love a make ahead meal, which is typical given my profession, but I was sleeping on Queso, which is a recent discovery for me. I avoided it because it reminded me too much of Velveeta cheese from my youth; you know the stuff, the rubbery rendition of liquid cheese. Nonetheless, I painted Queso with the same brush. Boy, have times changed! Bon Appetit is one of my favourite magazines, as it’s full of delicious food inspiration that just gets me going lol; with both recipes that take a full day in the kitchen, to the simple stuff that just gets you through the week (hello meal prep and planning!). 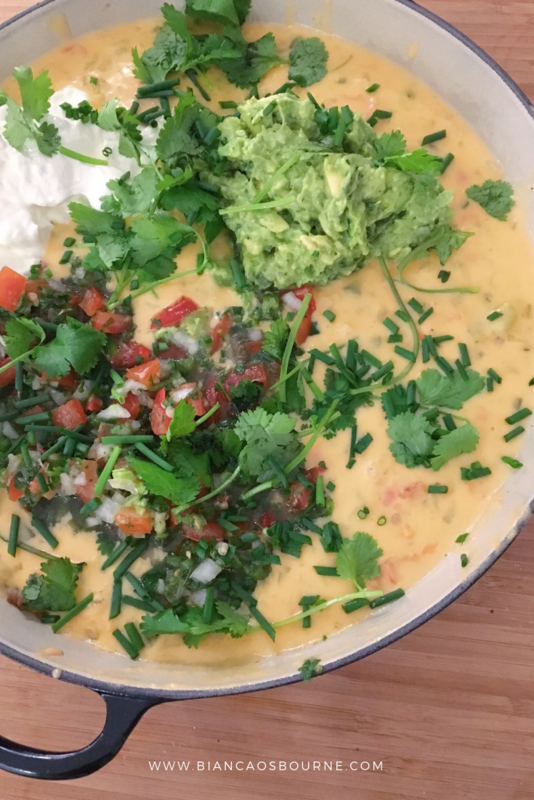 This Queso recipe is a share because I love it, but alas I didn’t create it; but what I wanted to share in this post is how you MAKE QUESO AHEAD and enjoy it with your friends and family. The Picadillo is effectively the flavour bit in the Queso, kinda like salsa, but the chunky, “get-in-mexico” style salsa; and you can make it a few days ahead! Picadillo can also be consumed with chips (traditionalists rejoice), or as a garnish on salad or meat. Don’t sleep on all the other uses for Picadillo. The full queso can be prepared ahead, and stored in the refrigerator for 1 day, BUT don’t assemble all the elements until you’ve reheated the queso and are prepared to serve. Instead of using all purpose white flour, which is what is used to make the creamy, cheesy roux, use Cassava flour instead. This flour is 100% gluten and grain free AND falls within reasonable macros! Spread warm picadillo in a. baking dish. Pour hot queso over meat. Top with a generous scoop each of pico de gallo, guacamole, and sour cream. Sprinkle with chives and cilantro. Serve hot dip with chips. Thank you Bon Appetit for ALWAYS inspiring beautiful meals!